Italy's biggest bank plans to raise €13 billion ($13.8 billion) and slash thousands of jobs to shore up its finances. 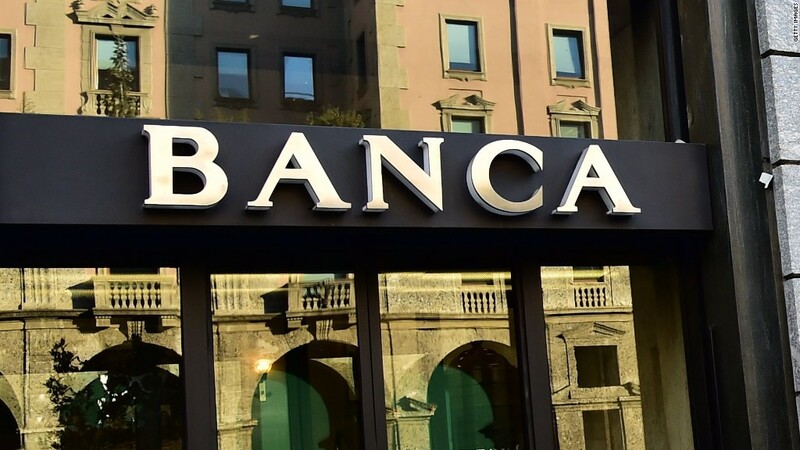 The sweeping overhaul announced Tuesday by UniCredit SpA will push the total number of expected job losses at the Milan-based bank to 14,000 by 2019. That's about 10% of its employees. The job cuts will reduce costs by €1.1 billion ($1.2 billion). The bank plans to move €17.7 billion in bad loans off its balance sheet by packaging them and selling them to investors. And it will take a charge of €12.2 billion in the fourth quarter. Unicredit (UNCFF) also sold a number of businesses as part of its rethink. Shares in the bank jumped 5% in Milan. They have lost roughly 50% of their value so far this year. Italy's banking sector has become a top worry for investors in recent months. The country has more bank branches than pizzerias, according to the OECD, and they struggle with high costs and low returns. They're also struggling with a legacy of bad loans. The country's banks have accumulated $380 billion of non-performing loans during years of recession. Related: Can the world's oldest bank survive Italy's upheaval? The most dire case is Monte dei Paschi di Siena (BMDPF), the world's oldest operating bank. It's currently racing to raise €5 billion ($5.3 billion) after it failed an official test of its financial health earlier this year. If the bank fails to convince investors to put up the cash, the state could be forced to bail it out. Political and economic uncertainty following the resignation of Prime Minister Matteo Renzi appears to have kept investors from signing on the dotted line. Still, Monte dei Paschi is trying one more time to save itself. Renzi stepped down after voters rejected constitutional reforms he had championed. His departure has plunged Italy's political system into disarray and raised the likelihood of early elections in which eurosceptic parties could make major gains. -- Nina dos Santos contributed reporting.